Provide comfort for the family of Ludie Chapman with a meaningful gesture of sympathy. Ludie Lucille Chapman, age 91 of Milford, beloved wife of Russell F. Chapman, passed away January 25, 2019 at Milford Hospital. Ludie was born in Rome, Georgia, August 11, 1927, daughter of the late Samuel L. and Mary Hardin Hogue. She worked as a secretary for Mayflower Kenworth for many years until her retirement. 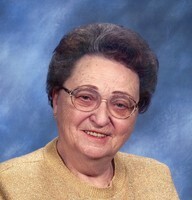 She was an active member of the Milford Senior Center and of the Milford Gospel Choir. Besides her husband, she is survived by her son Russell (Chip) Chapman and his wife Candace of Milford, her grandchildren Michele and Karlee Chapman, her great-grandchildren Isabella and Jacob Stevenson, and her nieces Diane Hernciar, Linda Rodko and her husband Tom, and Patricia Dupinsky. Besides her parents, she was predeceased by her brother Hubert Hogue and her sister Evelyn Dupinsky. Calling hours will be held Tuesday, January 29, 2019 from 11am to 1pm at Smith Funeral Home, 135 N. Broad St., Milford with funeral services to follow at 1pm with Rev. Ken Fellenbaum officiating. Interment will be private. In lieu of flowers, memorial contributions may be made to Toys for Tots, c/o Milford Fire Department, 72 New Haven Ave., Milford, CT 06460. To send flowers in memory of Ludie Lucille Chapman, please visit our Heartfelt Sympathies Store. We encourage you to share your most beloved memories of Ludie here, so that the family and other loved ones can always see it. You can upload cherished photographs, or share your favorite stories, and can even comment on those shared by others. Provide comfort for the family of Ludie Lucille Chapman by sending flowers. Ludie was a sweetheart and sharp as a tack to the end. She will be sorely missed. Condolences to all of her loved ones.